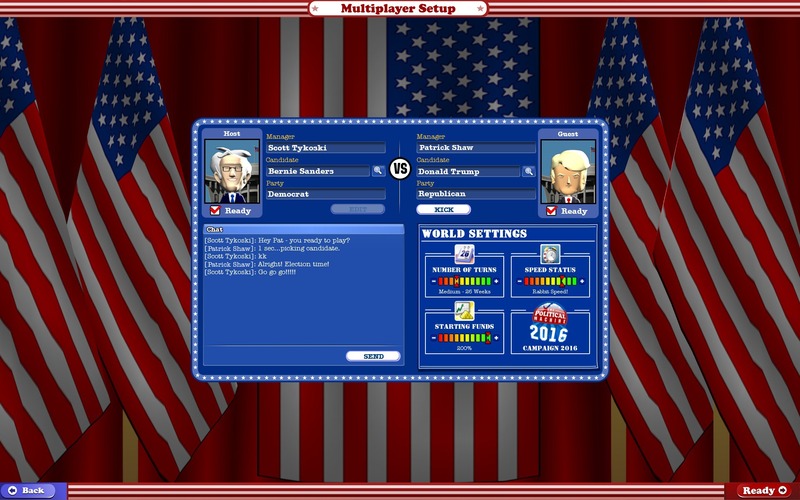 Turn Your Friends into Frenemies - Multiplayer is Now Available in The Political Machine 2016 v.80! Climb to the Top of Capitol Hill... Watch your Friends Roll Down to the Bottom! You asked for it, so here it is: the chance to stampede over your friends' campaigns and become the new President of the United States of America! v.80 is now here with the new "multiplayer" option, complete with lobby and in-game chat so that you can sling mud at each other throughout the course of your campaigns. This update also includes some new issues that reflect current national and international events, and some graphical stability fixes. Take a look at the complete change log for more details on the new additions. Happy (Campaign) Trails to you! Most issue values have been changed. Of particular note, Fighting ISIS, Securing the Borders, and Resettlement of Refugees are now top issues. Updated issue importances to reflect current events. For example, recent events in Chicago have increased the importance of #BlackLivesMatter in Illinois. ISIS, Migrants, and Securing the Border (immigration) are also likewise more important as national issues. Updated the issues for more variation between states. Updated the "Keystone XL" description to reflect that the Obama Administration rejection of the project in November. Increased Trump's "Media Bias" score a bit to reflect that fact that his supports are energized by negative media attention. "Use Hardware Cursor" will no longer make the cursor invisible. Mouse cursor is now DPI aware. This should address problems where the mouse pointer was offset from the mouse or moved a different speed. Added support for higher resolution monitors. Added a "Fullscreen" choice in the resolution spinner control on the Options Window. Options Window will wait to warn you about needing a restart until you leave the options Window, rather than warning you as soon as you change an option that would require a restart. Fixed z-order issue that was causing the characteristics/issues section of the Choose Candidate Window to not show up for opponents. When playing in windowed mode, the game will remember it's window position next time you start. 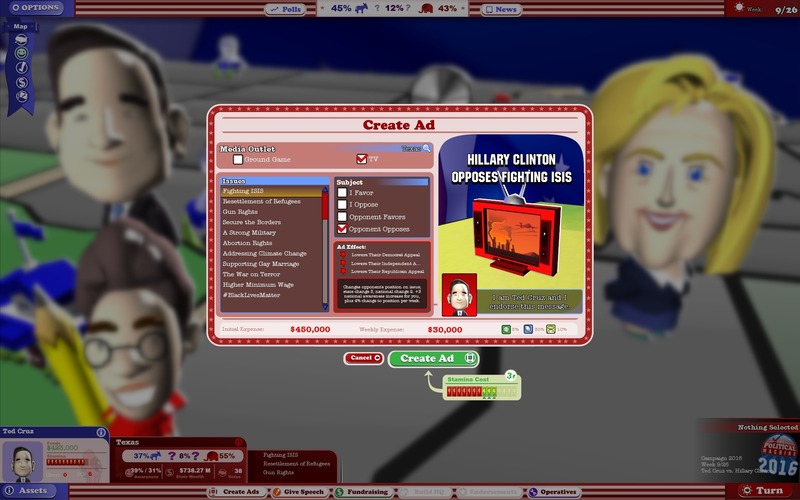 Endorsement effects (e.g Fighting Isis: +10) are now displayed in the "endorsement is won" screen and in the Weekly news report. Disabled action buttons when you cannot perform them (ie. not enough stamina/money/clout/etc), and tooltips explain why. Added custom images for the "War on Drugs"
Fixed issue on the World Setup Window where the slider description would not always match the slider you are modifying. Main screen: The state awareness text will no longer be clipped if either or both candidate reaches 100% awareness. 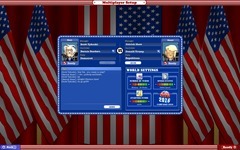 Main screen: Fixed the Assets Button and Candidate Info button as their functionality was switched. Changed the highlight color of first/last name controls on New Candidate Window from black to gray. 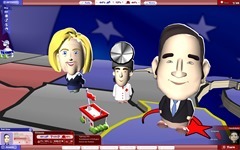 The "Party" sort button is hidden when choosing a running mate as all candidates shown will match your party. When "time in game" updates mins or hours, if you are on the Title Window, it'll update its text display of time played. Adjusted the formulas for displaying "thumbs up" and "thumbs down" to provide better feedback. The Host and the Peer can no longer rename the game on the password window. 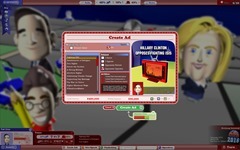 The Host can now name the game on the "Create Game" screen. Fixed several problems where a player's national issue value was having their party's default value added to it multiple times, causing it to have a stacking effect. This had the effect of making some issues that were not very important during the game to be incorrectly ranked too high in the national polls.